Please join us for two upcoming shows by Kali Quinn, performance artist, violinist and educator. 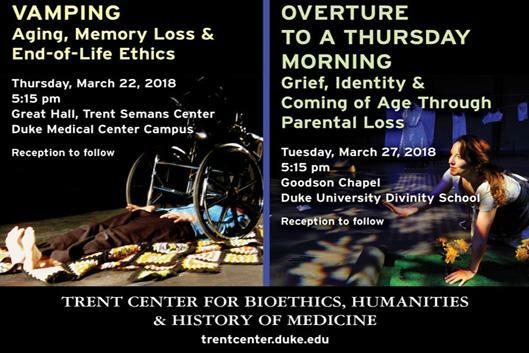 Through the transformation of familiar objects, montages and music, Kali Quinn's two performances share everyday stories that tap into themes of medicine and spirit, grief and gifts. Ultimately, they speak to how we better care for ourselves and each other through the generations. When rock-star wannnabe Lila inherits all of her mother's things upon her mother's death, she discovers the astonishing truth about her own birth in an infant home for "unwed" mothers. This performance is a suspenseful and inspiring journey that questions the will to go on and who to take with you. Kali Quinn has been in residence in the Duke Theater Program as a Movement Designer on Uncle Vanya, Machinal, and Enron. Her two solo shows about grief and intergenerational dialogue have been performed at universities and festivals throughout the country including Brown University Creative Medicine Series, Full Circle Festival of Aging and Los Angeles Women's Solo Festival. Each show will be followed by an an audience talk-back and reception.